Extending the benefit of your new Grenadian passport to your immediate family members is easy. You can include your spouse, your financially dependent children under 25, and even dependent parents over 65. The citizenship-by-investment program of Grenada is one of the fastest: you can have your new passport in your hand in as little as 3-4 months. To obtain Grenadian citizenship by investment, your first option is a non-refundable donation. This option guarantees the fastest and most straightforward procedure: the decision is made in approximately 60 days after submission, with your passport being ready in another 10 days. The second option is to invest in real estate. In this case, the timeframe depends on the progress of the real estate project, so it is vitally important to choose one that provides all documentation for your citizenship-by-investment application. No previous managerial experience is required for either option, and you do not have to travel to Grenada during the application process. 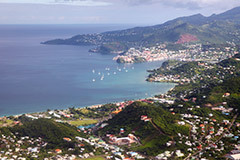 Once you obtain your citizenship, you can choose to live outside of Grenada – in which case you will not have to pay taxes on your worldwide income. With a Grenadian passport, you can travel visa-free to more than 120 countries, including the Schengen Area of the EU, the UK and China. Moreover, you will be eligible for an E-2 non-immigrant visa to the United States. The easiest way to obtain Grenadian citizenship by investment is to make a non-refundable donation to the National Transformation Fund for a minimum of USD 200,000. If you choose the real estate option, you will need to buy property from a government-approved project for a minimum of USD 350,000, and keep it for at least 3 years. Additional fees include a due diligence fee of USD 5,000 per adult, a government processing fee of USD 1,500 per adult, and government application and passport fees for a sum of USD 1,750 per applicant. For the real estate option, there is an additional government fee of USD 50,000 for a family of four. The amounts quoted here vary based on the number and age of family members included in the citizenship application. Contact us for a precise quote tailored to your situation.